Amidst the partisan rancor and the unusual tilt toward questions on civility during the second and third presidential debates, Hillary Clinton and Donald Trump drew the attention of health experts when they articulated their path forward for health policy in America. Responding to questions about the lack of affordability in the Affordable Care Act, the candidates detailed how they would address the increasingly glaring flaws in President Obama’s signature policy achievement. Trump, who called the ACA a “disaster,” has pushed for repeal of the law. He wants to replace it with block grants for Medicaid and the sale of health insurance across state lines. Clinton has emphasized the positive aspects of the ACA, including safeguards to ensure that insurers cannot deny coverage because of an applicant’s preexisting conditions. She has argued that changes must be made at the edges of the existing law. As important as these discussions have been for providing the American public details about each candidate’s future plans in the health policy arena, they were also significant for the option they ignored – the possibility of universal health coverage in America. The ACA certainly brought us closer to universal coverage, a system where the government typically pays for basic health care services for everyone. However, the fact that a true national health insurance system didn’t even warrant discussion by the major party candidates is surprising – or at least should be. The United States remains one of the only advanced industrialized democracies in the world without universal coverage. While this in and of itself is not a problem, the United States also spends more on health care as a percentage of GDP than any other advanced country in the world and has worse health outcomes – with lower life expectancy, higher infant mortality and higher obesity rates than comparable countries like Australia, Canada, the United Kingdom, Germany, France and Japan. It is also surprising because Bernie Sanders, running on a platform that included universal coverage or what he called Medicare for all, generated massive grassroots support and energized the millennial population that makes up an increasing percentage of the electorate. Given these facts, it is important to ask: Why isn’t universal coverage through a national health insurance system even being considered in America? Research in health policy points to three explanations. One key reason is the unique political culture in America. As a nation that began on the back of immigrants with an entrepreneurial spirit and without a feudal system to ingrain a rigid social structure, Americans are more likely to be individualistic. 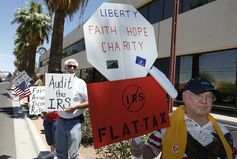 These protesters show how they feel about big government. In other words, Americans, and conservatives in particular, have a strong belief in classical liberalism and the idea that the government should play a limited role in society. Given that universal coverage inherently clashes with this belief in individualism and limited government, it is perhaps not surprising that it has never been enacted in America even as it has been enacted elsewhere. Public opinion certainly supports this idea. Survey research conducted by the International Social Survey Program has found that a lower percentage of Americans believe health care for the sick is a government responsibility than individuals in other advanced countries like Canada, the U.K., Germany or Sweden. Even as American political culture helps to explain the health care debate in America, culture is far from the only reason America lacks universal coverage. Another factor that has limited debate about national health insurance is the role of interest groups in influencing the political process. The legislative battle over the content of the ACA, for example, generated $1.2 billion in lobbying in 2009 alone. The insurance industry was a key player in this process, spending over $100 million to help shape the ACA and keep private insurers, as opposed to the government, as the key cog in American health care. Recent reports suggest that lobbyists are already preparing to fight a potential “public option” under the ACA. Should any attempt at comprehensive national health insurance ever be made, lobbyists would certainly mobilize to prevent its implementation. The political system is prone to inertia and any attempt at comprehensive reform must pass through the obstacle course of congressional committees, budget estimates, conference committees, amendments and a potential veto while opponents of reform publicly bash the bill. Ultimately, the United States remains one of the only advanced industrialized nations without a comprehensive national health insurance system and with little prospect for one developing under the next president because of the many ways America is exceptional. Its culture is unusually individualistic, favoring personal over government responsibility; lobbyists are particularly active, spending billions to ensure that private insurers maintain their status in the health system; and our institutions are designed in a manner that limits major social policy changes from happening. As long as these facts remain, there is little reason to expect universal coverage in America anytime soon, regardless of who becomes president.